Delaware County’s Alex Dilks Pandola sings his parody about the papal visit. Pope Francis will be in Philadelphia in less than a month, and people have been preparing in a number of ways. 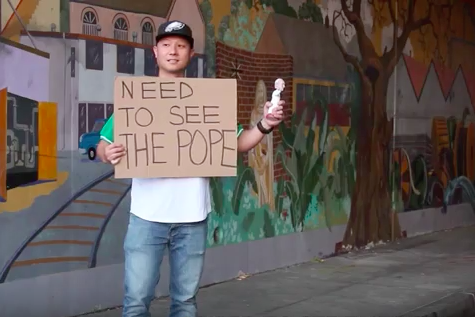 Delaware County's Alex Dilks Pandola, who goes by Delco Dilks on his YouTube channel, released a video Monday that turns Lady Gaga's song "Dope" into a parody video about the papal visit. Accompanied by a pope bobblehead, a cat, a porta-potty and a little boy in Eagles apparel, Dilks sings about his "need to see the pope." "I don't know how to get in. / Cause they closed the Ben Franklin," he sings as he climbs a fence, maps out the city and parks near the zoo. "God can the Birds win? / Don't even try / to get on I-95. / Our city shut down cause of you. / Put up a fence cause of you."